Today is a happy post! Yesterday was a great day since it marked my last day of hell work for the the next two weeks!! Add to that some good news for a very dear friend of mine AND that today is my 1 year Anniversary of being married – and well good things come in threes! Of course I am spending my Anniversary day alone while the man of the house is at work and then going to his sending off party… which is a bit of a bummer. But the thought of not having to work AND going back to the land of non-Japanese food and fitting clothes has put me on a bit of a high!! I did NOT want to get out of bed this morning. But… I somehow managed. If I can just get through the 8 hour workday I will be free for 2 weeks. The longest vacation, I think, that I’ve taken from work thus far. It has not been easy… especially because of the lousy rainy and cold weather we’ve had this week. I may have a touch of SAD and either way rainy days who really wants to hop put of bed into a dark room. Not I for sure. I sort of wish we were leaving earlier than Monday, but Ryohei still has his last day, actual last day of his company in Kobe tomorrow, plus the obligitory sending off party (yawn) AND he’s going up to Osaka Sunday to get his haircut… (yes he goes almost an hour by train to go the same place he used in university) but whatever. I guess I’ll be alone for pretty much most of the weekend. Hopefully my latest TV obbsession, Top Chef, will get me through it. Monday will be busy since we have to get up and out to pick up last minute “omiyage” for my parents and brothers, get lunch, and then take the bus to the airport. From there it will just be more waiting until we land at San Fran. where I will gorge myself with American food and then another 2-3 hour wait until our flight for San Diego leaves. So… although techinically theres only one day of “work” left the waiting is still there. Ahh the difference a month makes. Same shirt, different belly! And in a follow up to Sundays post – mi madre has booked the 4d appointment for Tuesday afternoon so if you want to know whether it is a bambino or bambina make sure to check in around noon on Weds. Japan time! how freaky was that… so here I am thinking that someone has access to my email and now facebook accounts. I wanted to leave work early because I was so upset but I don’t have any time off at the moment since I’m leaving next week. So I probably gave myself even worse high blood pressure worrying about. So my public service annoucement to all of you: Don’t forget to change your passwords/have different passwords for different accounts. I am very very lucky that all I got was a shock and not a horrible mess. 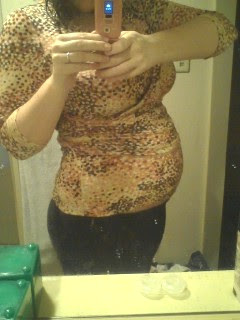 Leaving for my 5 month obgyn appt in about 30 mins! Hopefully the doctor will give us some guidance to what we are having! I’m nervous!! But still I was hoping to see more of the baby than just a rump and a spine… c’est la vie! Wow – after the beautiful weekend weather, the throwback to frigid has been rough. The wind is the most chilly I’ve felt it for weeks now. I’m still working hard towards my countdown towards home. Only… about 10 more days now? Anyways I’ll just do a few random blurbs to update on things lately. Not in the forever sense but in the I NEED a break, badly. The thought of going to work tomorrow is making me so depressed. I just want to get on the plane and go home now and be in MY country for just a little bit. I want familiar food, shops, and scenery. And I want to see my kitty. Two more weeks feel like an eternity.